This was from a French artist; DenXVII on deviantArt. Is very cool and I was glad to see it. The style is unlike much of the rest of the artist's work which is also very good. the UFO Series website, which I really love. It really is the definitive site. It is for UFO what SFXB and the Star Fleet Wikia are for Star Fleet but at the same time, it's so minimalist which fits the series so well. Anyway, on the news page, I found this website that had all the comic book scans from magazines etc. which are really well done and beautiful. 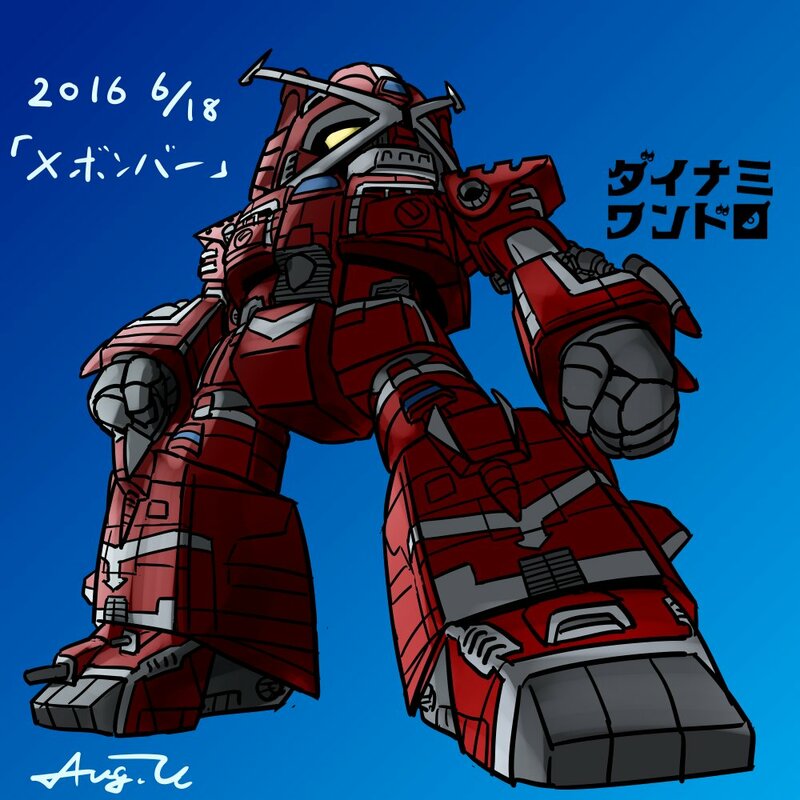 In particular, there are lots of images of the papercraft Dai-X by user; Akama Akama. The Scans and Merch folders have also received reinforcements. I came across something in Google Images (I think it might have been the papercraft Dai-X, which I only had a couple of pictures of before), which then fed me on to Twitter. I'm keeping an eye on something else from Japan which should make good scanning for the website but it has quite a few days before it ends. I saw somewhere as well that there is this "Robot Girls Z" TV show which is made by Toei Animation and Dynamic Planning, which are familiar names that were behind X-Bomber. So, it's Japanese and it's full of cute female characters styled after various giant robots from the studios' other productions. Anyway, in September, they announced some new characters for this show, including X-San, (it has nothing to do with fibrechannel or iSCSI) who is based on our Dai-X. 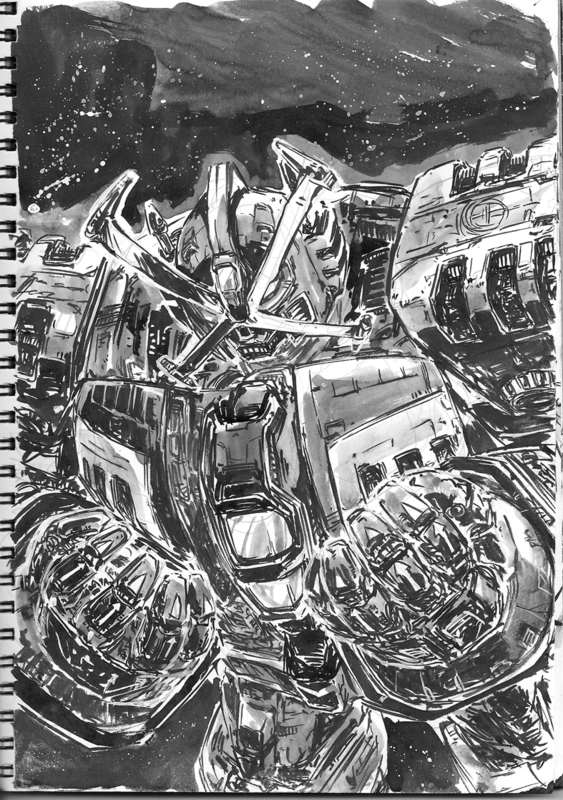 There we go, hopefully that should make some good scanning when it arrives, now that it's legally mine and PayPal's. My various Showa books seem to be getting closer. They're heading to the Tyneside mail centre. I'm looking forward to scanning those. Edit:... And Wednesday morning; they seem to have reached the depot in Ashington. Edit: Went and got these on Thursday morning from the post depot. They were pretty surprised that I was there to pay the duty and collect before they'd had a chance to put the grey card through my door. This image came from Pinterest. Their image quality is usually terrible. It is in fact the back cover of a really lovely A5ish-sized notebook that came with the story book. I had all kinds of things to do yesterday and this is the first scan that I finished. ... Don't worry, there's lots more to come soon. I put a summary on the page linked to above. I had fun with Krystal Hosting's support team in regard to the site's thumbnailing of large images; around 4000 pixels on any edge. I contacted the developer of the SLIR script and it turns out to be a memory limitation in PHP. I can see the script complaining of memory exhaustion in the PHP logs. The people at Krystal kept reporting (3 times): "we've increased the memory, check it now". The last time, they said "we've upped it to 1GB; the maximum for this hosting plan". I can see in the PHP logs, the amount of RAM available was 1GB even before I reported the issue to them. Useless as a sack of dead gerbils. So, I implemented a 'workaround' on the site. For the huge images, I upload the original file plus a downsized-but-still-big image that SLIR can process. The original is a hidden file called ".filename.ext". When the website indexes the non-hidden file, it checks for a hidden, larger equivalent with the above naming convention and, if it finds one, it displays a "hi res" link to the larger, hidden file as well as the visible one. I thought I'd have to wait for a while before the other colouring book materialised but I found it today. I'll see if I can get it and, obviously, scan it. Rinkya went and got if for me. I guess nobody in Japan really cares much about Star Fleet. That being said, I don't think the item is especially rare either. Anyone that wanted one there could get one easily. Anyway, with all the commission etc., a $22 item became a $58 item and that's before we come to ship it to the UK. He's good, isn't he. I have him in my small collection. I put some of the Japanese into Google Translate and you don't wanna know what came out the other side. I had Rinkya send on my new Showa colouring book and it has been shipped off to the UK. I had 60 days of shipping since there were no other cool X Bomber items. I also checked for any Gerry Anderson Firestorm stuff but there wasn't anything that I wanted. There are some pictures from Terrahawks that I've not seen before.